How to create your own habit dashboard that motivates you to stick to any habit? Consistency has always been a challenge for me. Despite defining clear goals for myself, I have always struggled to create the habits that would lead me to fulfill them. I had the motivation and time, yet I would consistently fail somewhere around day 10. Failure kept leaving me angry and frustrated, and compounded into a disbelief in my ability to succeed. Working on consistency seemed unpleasant and verging on impossible. My motivation was gradually weakening, leaving me to comfort myself with snacks while binge-watching inspiring TED talks. “Better than funny TV shows,” I kept reassuring myself. But I knew I wanted more. And that’s when I broke through. Ultimately, I created a new journaling habit designed specifically to support my consistency in working on new habits. In this article, I’ll show you how you can use this same approach to work on your own goals. Awareness of the changes one desires to make. Identifying potential problems and solutions. Commitment to actually making the change. I designed a journaling system to help me remain aware of my goals, gain clarity over problems and solutions, and form strong personal accountability to help me stay committed. A report from Kent State University shows that journaling has many benefits, such as increasing our ability to evaluate experiences and clarifying thinking processes. I also knew from my own experience that whenever I took the time to journal my thoughts first thing in the morning, my whole day would become brighter, my problem-solving skills sharper, and my actions more in alignment with my goals and my sense of purpose. Tracking my performance on my goals acts as a form of self-accountability, reinforcing my commitment. In order for my new system to work, it had to be intuitive, effortless, and, most importantly, deeply integrated with myself. In order for me to actually use it, it had to be fun. So how did I achieve this? It’s simple: I found a way to engage both my rational and emotional mind in the process. It takes only 5 minutes of my day, max, and yet it is the most powerful tool for consistency I have ever tried. I call it my “Minimalist Journaling System”. As soon as I started using it, everything changed: this system prompts me to set goals and track my progress, and broadens my perspective of the overall process. At the same time, it turns my emotions into fuel, giving me motivation, aesthetic pleasure and fun. Read on for the details, and examples of how to apply it yourself. Every morning I draw a square. Each square represents one day of my life. At the end of the day I fill in the square with information. What I need is paper (my journal), a pen, and 5 minutes of my time every day. 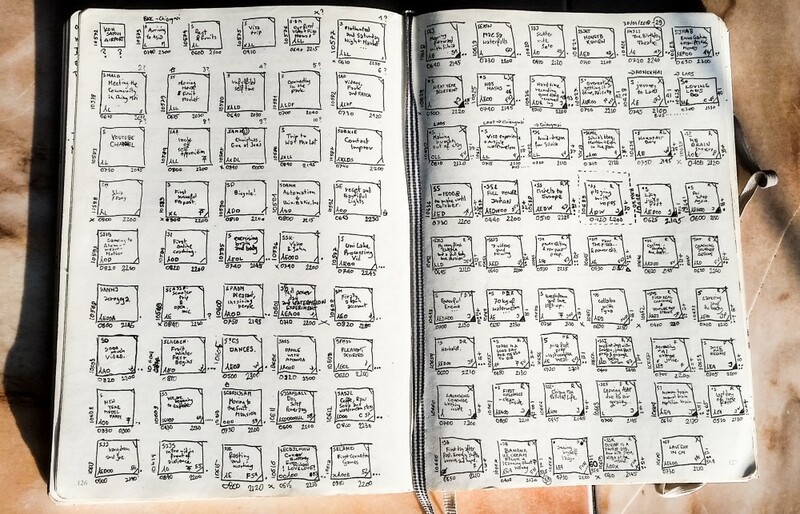 Each square has a unique ID number, indicating which day of my life it is (you can calculate it here). Every morning when I write the number, I remind myself that every day is unique and will never happen again. Consequently, from the early start I’m in “carpe diem mode”, ready to live another fulfilling day. On the other hand, since there are so many squares, I feel reassured that even if I fail, I can always start over. Every square is a new empty white canvas, giving me a chance to fill it with amazing content. Some days I feel like I have done nothing and wasted my time, and in the evening I have nothing to record. This usually makes me feel really embarrassed, but I use that embarrassment as a weapon, as it boosts my motivation to make the following day outstanding. Moreover, when I feel low or doubt my progress, I look back at all the squares and all the things worth remembering. This fills me with a profound sense of gratitude, which is scientifically proven to have astounding effects on our general well-being and motivation. Squares are an incredibly simple visualization of data. Since they are small, I’m forced to record only the essential. Furthermore, since what I track evolves over time, I need to constantly optimize the system itself, which keeps me focused and engaged. Most importantly, I simply enjoy looking at all the squares together. Their visually pleasing aesthetic keeps bringing me back every day to draw yet another square. Squares have been so much fun to use that I haven’t skipped a single day since I started (half a year ago). This is crucial, as it removes mental blocks connected with habit building and consistency. My UI brings me so much pleasure that I simply cannot imagine myself skipping a square. Sharpen myself by intermittent fasting. Trackable step: Not eating after 18h00. Visual tracking: “+” if successful, “–“ if unsuccessful. Improve my work by eliminating distractions. Trackable step: No email or social media outside of specific time slot. Improve my relationships by replacing anger with compassion. Trackable step: Every time I feel angry before interacting ask myself — “Am I acting from a place of compassion?”. If I travel, I write down where I traveled to. … and this one that I had a lucid dream. Marked if I had problems sleeping. Time I went to sleep. Indicates I had ‘self time’. Number of meaningful interactions I had that day. Indicates I wrote a hand-written letter that day. “Have I been acting from a place of compassion today?”This is one of the focus areas of my current 30-day improvement plan. R — reading, D — watching a documentary, L — other forms of learning. Indicates I have meditated for at least 30 minutes. Indicates that I used social media/email outside of allocated slot. This is another one of the focus areas of my current 30 day improvement plan. Y — yoga, S — swimming, H — hiking, O — cycling, E — workout, R — run, D — dance. F — fruits, V — vegetables, N — nuts, A — animal products, C — coffee. Indicates I ate only raw food. Number of times I moved my bowels. Did I eat after 18h00?“+” if successful, “–“ if unsuccessful. This is the last one of the focus areas of my current 30 day improvement plan. Number of days eating raw in a row. Over the first few months of using this system, I became an effective habit-building machine. Let’s have a look at my daily workout habit since I started with this journaling practice. After I had been tracking my daily workouts for 84 days, I noticed that I had skipped 34 of them, which left me with a failure rate of approximately 40%. It’s not an exceptional mark, but it’s better than what I would have been able to reach before applying this system — before, I never even managed to maintain an exercise routine for more than 2 weeks. However, the insights brought by this journaling practice allowed me to take my progress even further. As I tracked each specific exercise on my routine, I noticed that the main problem was that I didn’t enjoy the particular kind of workout I was doing. As I saw this, I knew that all I had to do was change it by implementing a routine that felt better for me and for my body (that’s when I stopped doing calisthenics and began my yoga practice). After that, my failure rate dropped to 8% (6 sessions missed out of a total of 74). Other than physical exercise, adopting the minimalist journalist system helped me to transform my diet (99 days eating raw food in 2018 so far), quit coffee addiction (I only had 9 cups in 2018 so far, while before I was having up to 3 cups a day for months) and meditate daily for 141 days with a failure rate of 8%. That’s only a few out of my list of successes. I was also able to identify certain patterns, such as feeling the most productive and balanced when waking up no later than 6am. It’s an invaluable piece of information which keeps me rising early every day. The main benefit is that by keeping record of my daily habits, I keep myself accountable for my life. Squares don’t lie. They become my personal mirror reflecting my life back at me. But the transformation goes even deeper. I have always been very impatient, expecting immediate results — especially when it comes to myself. If I don’t succeed straight away, I lose focus and interest. Tracking my daily progress over a long period of time made me aware of the activities that I want to add or remove from my life. I remained progress-oriented, while noticing that I’m in fact succeeding and becoming consistent. Being successful in specific areas of my life in which before I would always fail has given me an unparalleled sense of confidence. I now know that I can rely on myself and that I do have the capacity to transform my habits (and my life) as I please. I trust myself that I can commit to anything I chose to. It only takes a page or two of my squares. I knew from the beginning that in order for the Minimalist Journaling System to work, it had to be based on a solid goal setting routine. However, I knew from my previous experience that having a lot of goals doesn’t work for me. It doesn’t work for most people, and successful people learn to prioritze ruthlessly: for example, after a long and heated discussion with his employees, Steve Jobs wrote down the 10 top priorities for Apple on a whiteboard. And then he crossed out 7 of them. Currently I use the “thirty day improvement plan” suggested by David Schwartz in his book The Magic of Thinking Big — but with a little twist. While Schwartz recommends focusing on 5 improvement areas every month, I realized that I achieve better results when focusing on only 3. Then I list three activities/habits on which I want to work on; one in each category. Next off I break down my goals into actionable steps, and I make every desired improvement trackable. This is a crucial point. For each activity/habit I write down a step, which I can take every day (ideally) or in any other interval that makes sense. Then I find a way to visually track it and record it in the squares. Sharpen myself by doing intermittent fasting. Visual tracking: I draw a plus (+) if I was successful and a minus (-) if I wasn’t. The final step is to track results. Whenever the month is finished, I review my improvement plan. It takes very little time, since I have been looking at the squares everyday and I instantly know to what degree I have been successful. I then decide to either set a new goal, modify the goal or keep the goal as it was. Then I move on to another month. Ready to make it yours? Whatever dashboard you create, be aware that what you track and how you track it will most likely evolve over time. That’s great news, as it means that you are progressing. My own journey began with tracking a few simple activities, and with time I learned that it benefits me to track my sleeping patterns, diet, relationships, travels, exercise, and learning — among numerous other things. I am now able to pay attention to more components of my life, while using the same amount of time and energy. Finally (and most importantly) — make it as much fun as possible. This is what will make you not want to skip a single day. Reaching your goals will still require work, but the journey can become wonderful in itself. You’re getting closer, one square at a time.